©FAO/Marco Perri26, October 2018, Turrialba, Costa Rica - Successful communication requires carefully developed messaging that ‘speaks’ directly to important target audiences and addresses any misconceptions about forest management, specialists in forest-related outreach explained during a training workshop for the Latin America and the Caribbean Forest Communicators Network. Twenty participants from 14 countries participated in this interactive workshop organized by FAO and the Tropical Agricultural Research and Higher Education Center (CATIE) in Turrialba, Costa Rica, with generous financial support from Austria and Finland. 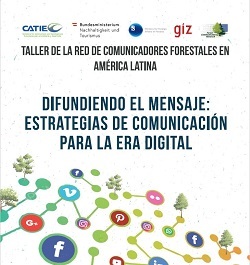 The workshop, ‘Getting the message across: Communication strategies for the digital age’, was designed to boost regional learning and to encourage knowledge sharing while providing state-of-the-art training in forest communications. Kai Lintunen, Head of International Communications for the Finnish Forest Association and Leader of the UNECE-FAO Forest Communicators Network, told the workshop that messaging should be positive, credible, relevant, clear and brief and expressed in language accessible to the audience. That approach can be especially important in reaching new audiences outside the forest sector, he added. Lintunen also recommended communicators to aim to offer solutions rather than focusing on identifying problems. He advised communicators to target not only decision-makers, but to also identify and then influence opinion leaders and champions who are trusted in their communities, in order to effectively spread messaging. Other speakers, meanwhile, emphasized the value of ensuring that gender is taken into account when formulating communication strategies, explaining that gender equality needs to be addressed at the early stages in order to maximize outreach.